Here’s some interesting links and projects that I’ve come across this week. Carolyn at Handmade by Carolyn made her own pair of shoes! Lillian Weber, a 99 year old woman from Iowa, makes a dress a day to give to charity. Read the sweet story here. I will always needs more pattern weights. The little ones I made here aren’t really heavy enough. Maybe some like these? Did you find anything this week that particularly inspired you? Or buy any new books or classes? One type of skirt that I didn’t often wear was a pencil skirt. It’s not because I didn’t like them; I love the look of them. But mass-produced pencil skirts that fit me through the hips require a smaller waist than I have. 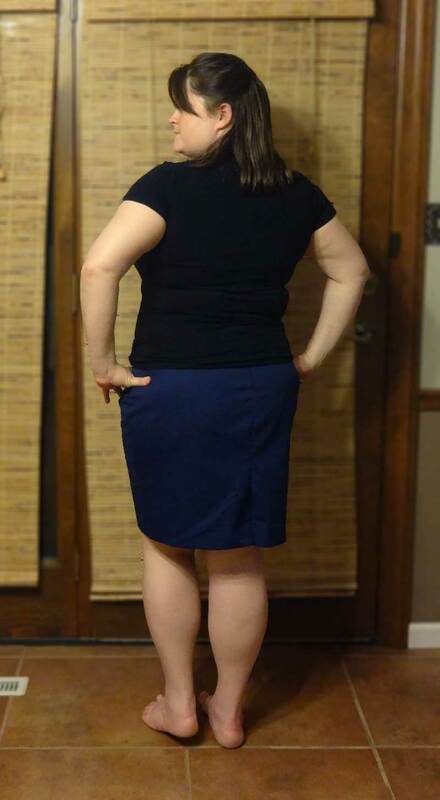 The only skirts I’ve had that even sort of had this shape were stretch fabrics of some kind. But now I have no limitations on the pencil skirt! This is a self-drafted pattern and I love how it looks! The back has an invisible zipper in the center back seam and a button closure on the waistband. I’m proud of myself for learning how to do the overlapping waistband and a button and buttonhole, but I didn’t do the best quality work on it (hence: no close up pictures…). There’s also a walking vent on the back seam, which I learned to do from this tutorial on A Fashionable Stitch. Next skirt in my head to draft and make: a denim skirt with piping and pockets. While I think many of us are aware of dressing for our proportions, here’s a fantastic article that shows the impact of choosing flattering clothes. 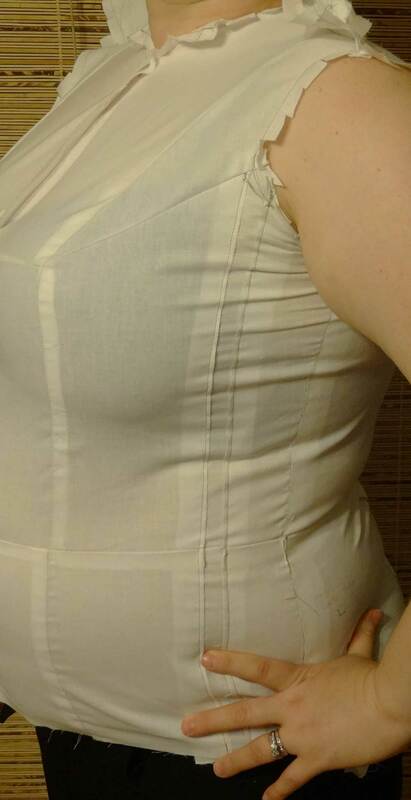 I’ve been slowly working through a Craftsy class called Patternmaking Basics: the Bodice Sloper. 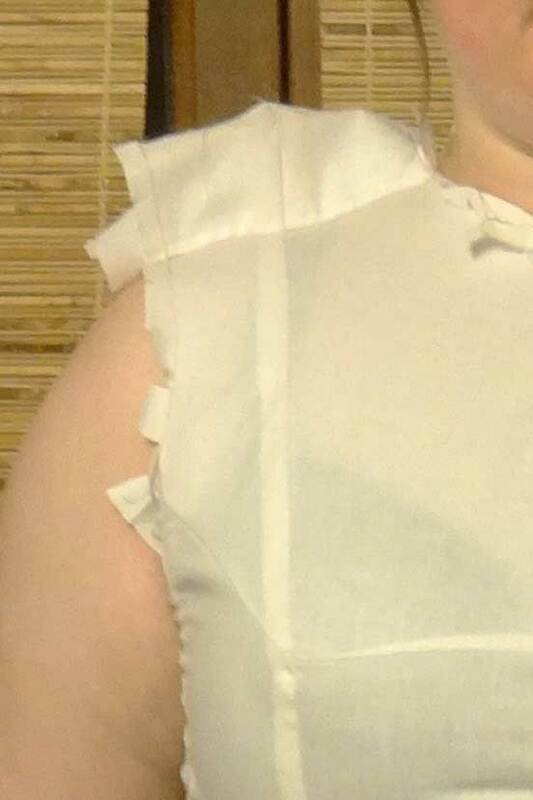 Currently, I’ve got the fit of the muslin right, for the most part, but now I have to transfer the changes to the moulage pattern. The fitting required some finagling. My first moulage fit beautifully on the back, but the front was so tight, I couldn’t close it up (no pics of that one!). So I remeasured, tried again with some bigger measurements in the bust and the waist and drafted and sewed a second one. This one fit better in the front, but not entirely (so yeah, still no pics…), but didn’t really fit in the back. Rather than try to figure it out (because the back is really really hard to do when it’s on yourself) I decided to take the back of the first one and the front of the second one and try to marry them up. It worked very well on the sides, and even the shoulders went pretty well. Still wasn’t big enough to close, so there was some slashing and spreading and armhole dart taking in in order get it to close down the front. It all worked in the end and it fits, but man, is it tight. I posted pics (finally, there’s pics!) on the Craftsy platform to ask Suzy about the fit and she said good to go, other than some vertical waist changes. I can’t believe how much fun I’m having with this process, even when I frustrated and ready to wad everything up and chuck it. (That sounds like an oxymoron of some kind, but it’s true.) I’ve measured my sister and started drafting her moulage as well. When I asked if I could measure her, she gave me a look that distinctly said, “I tolerate you and your hobbies.” :). However, I need to finish up some other project before I sew up her moulage musin. I think this class is fantastic for learning this process. I’m curious if Suzy Furrer’s methods are unique to her or if this is more standard flat pattern drafting material Either way, her style of teaching and the online format really work for me and I love it! Dixie DIY interviewed a costume pattern designer who works for/with Simpliticy patterns, Andrea Schewe. The interview was interesting from both the costume design standpoint as well as from getting a look into what it’s like to work with a Big 4 pattern company.